In fact you can use any open port you like, but they have to match in the browser and the port you add to the options. Note I used 5500 in both. I got in the habit of avoiding 8080 as some ISP block that port for some types of IO and it is also a popular port for other application. However using localhost that shouldn't matter. The beauty of this idea is the instruments/map/etc available on a seperate Android device thus freeing up the main screen and giving more of a real simulation experiance. what is your FG command line that sets up the internal web server? what is the URL you are putting in your browser's address bar? I've just realised that I forgot to insert --httpd=8080 in settings! Of course it works fine now tks. 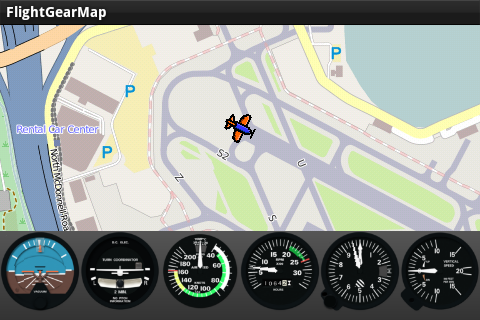 But FlightgearMap can put the instruments on any android device increasing realism and I still have recurrent connection timeouts! any idea how to debug this prob? It did actually work really well before, I've no idea what happened. I don't even know what kind of protocols/connectivity it is using - so it's hard to troubleshoot this, unless someone steps in who's more familiar with the tools involved here. last system updates wiped out the andatlas.xml file which must be in the FG_ROOT folder! Do you mean it works sometimes and then other times it times out? Or it times out and never works? Not trying to turn you off of FGMap, but the built in one works on any Android tablet that runs a web browser. included andatlas.xml in the fgdata/Protocol folder and it worked fine on my Android device.